Ray-Ban RX2447V eyeglasses are a consummate example of the classic, preppy, round shaped look. Equally fitting for art students and executives. 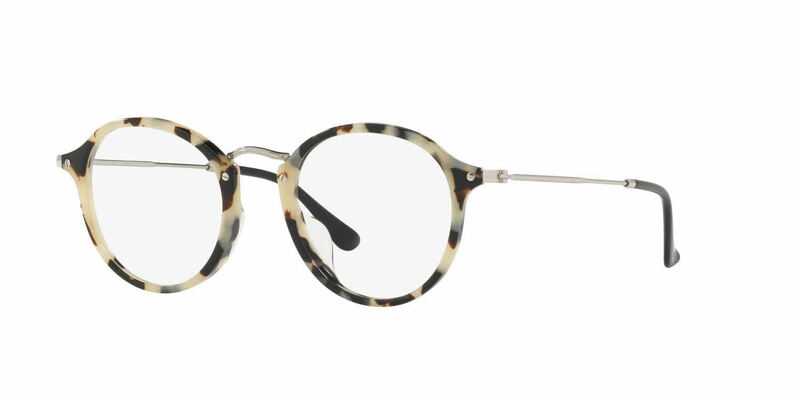 Full Rim frame with a lustrous, acetate frame front and temples and bridge made from corrosion resistant Monel; a metal alloy with a copper and nickel base. These are great - exactly what I wanted and have gotten compliments every time I put them on - Just love them. Though I love the style, the nose piece is a bit weak and can easily break. Everything I wanted and very reasonably priced. Delivery time was ok but can't expect much better coming from America to UK. This glasses size is its best features, it brings out your eyes and complements all face. Giving you an air of intelligence, it's my favorite but so far. The case is a must because its thin frame makes it more fragile than other sturdier Ray Ban frames. Was uncertain about buying a pair of glasses sight unseen - so to speak. But, there is a return policy so, no biggie. Received them in the amount of time I was told and they're great! People have complimented me on them and - most importantly - they fit great. :) I'm sold.